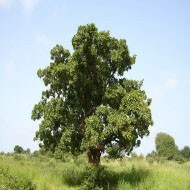 This tree is present only in the wild in the wooded savannah of West Africa. The fruit of this tree contains a nut which, once pressed, allow us to make shea butter. This butter possesses numerous properties for the skin. It is nourishing, restorative, hydrating, healing and protects against UV rays.